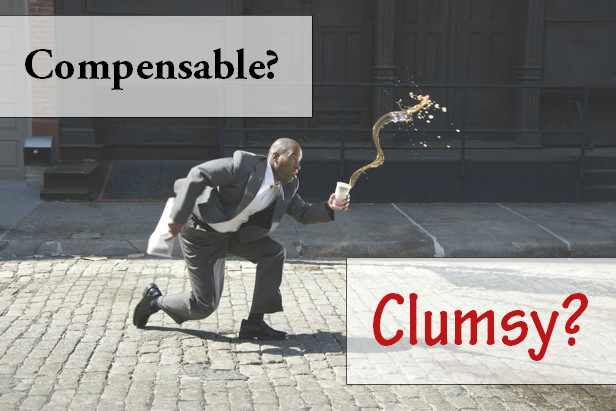 Workplace Injury: Clumsy or Compensable? The mere fact that an individual suffers some sort of injury while at his place of employment is not sufficient to render the injury compensable. Under the South Carolina Workers’ Compensation Act, and the case law interpreting the Act, the Claimant must prove that the existence of two separate criteria. Specifically, to be compensable, an injury must be one “arising out of and in the course of employment.” S.C. Code Ann. § 42-1-160(A) (Supp. 2013). The two parts of the phrase “arising out of and in the course of employment” are not synonymous. Also, both parts must exist simultaneously before a court will allow recovery. “Arising out of” refers to the injury’s origin and cause, whereas “in the course of” refers to the injury’s time, place and circumstances. For an injury to “arise out of” employment, the injury must be proximately caused by the employment. An injury arises out of employment when there is a causal connection between the conditions under which the work is required to be performed and the resulting injury. An injury occurs “in the course of” employment when it happens within the period of employment at a place where the employee reasonably may be in the performance of the employee’s duties and while fulfilling those duties. Shatto v. McLeod Reg’l Med. Ctr., 759 S.E.2d 443 (2013), citing Ardis v. Combines Ins. Co., 380 S.C. 313, 669 S.E.2d 628 (Ct. App. 2008). When an employee has an idiopathic fall while standing on a level surface, and in the course of the fall, hits no machinery or other objects that would otherwise contribute to the effect of the fall, the majority of jurisdictions deny compensation. Crosby v. Wal-Mart Store Inc., 330 S.C. 489, 499 S.E.2d 253 (Ct. App. 1998)(citing 1Arthur Larson Lex K. Larson, Workers’ Compensation Law §12.14(a)(1997)). The reasoning behind this viewpoint is that the basic cause of the harm is personal, and the employment does not significantly add to the risk. Id. Most recently, the case of Nicholson v. SC Dep’t. of Soc. Serv., serves to establish that the fact that a claimant is carrying or handling objects during the course of an injury is not dispositive on the issue of whether such injury arose out of her employment. Although Nicholson was carrying ten case files weighing approximately 15 lbs. at the time of her fall, she testified that the files did not cause her to fall, but rather the friction from the carpet and her foot caused her fall. The Court of Appeals held that the carpet was not a hazard that caused or contributed to the alleged injury as it was very common and not peculiar to the work. This case is currently on appeal to the South Carolina Supreme Court, so we are awaiting the impact on that decision and the effect on the current case law.